Our world moves inexorably toward one big city. By the year 2050 we may have 75% of our world population in cities. Metropolis. She was the KickAss robot that ran the place. On the obverse is yet another iteration of The Man. 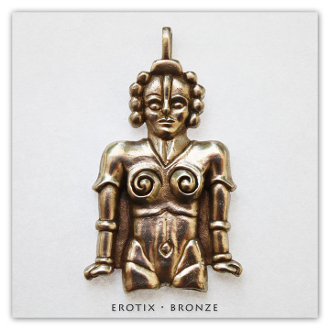 Erotix is available in solid: Bronze (Yellow), Sterling Silver (925 De-Oxidized), 14k Gold (Yellow) and 18k Gold (Yellow).